Just wanted to add 2 more NEW pieces of artwork for Ebay. These are drawings I am doing with fellow comic book artist~Chuck Foulds. First one is a pinup of HAMMERHEAD. The SPIDER MAN villain. 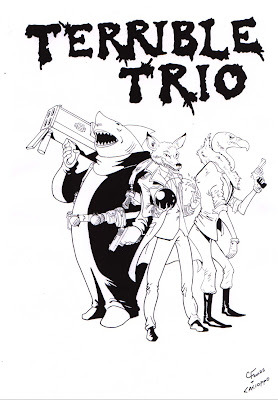 The second is a pinup of THE TERRIBLE TRIO. Villain's of BATMAN. These commissions are being done strictly for Ebay sales. In the past, most of my artwork being listed on Ebay were pieces that was used as either study or warm ups. Very rarely was artwork listed for Ebay listings until now. 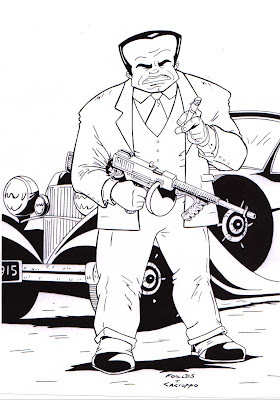 I am also in the process of doing commissions with another comic book artist~ Angel Gabriele. He just sent me some pencil pieces for inking. Once inked, we will be listing some of them as well.